GPD's services continue throughout the life of projects, ensuring that a well designed project is also well performed. 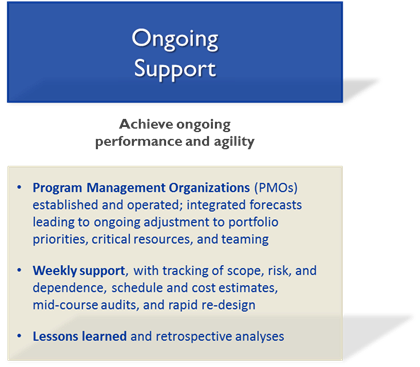 As teams make progress, the high-level project plan, coordination priorities, and teaming are maintained, analyzed, and reported.These sustainable project assets remain meaningful, adapted as the situation changes on the ground. In contrast to overly detailed traditional project plans that provide false confidence and are difficult to maintain, GPD's project design approach generates accurate forecasts of project completion and situational awareness of progress, dependencies, and risk amongst executives, managers, and team leaders.